After online registration closes, you will be considered a "walk up registrant" and you will need to arrive at the field at least 30 minutes early to complete registration. Online registration is preferred and will enable your player to be afforded a complete tryout session with the coach. If your player will tryout for more than one team (and at more than one location), during the registration process, please choose the location that they will attend first so their tryout number will be there. After that, they can use the same number to go to ANY Concorde Fire Tryout/Evaluation. Can’t attend tryouts due to travel? You must still register your player for tryouts and make a note during the application process that the player will not be present at the scheduled tryouts. Then let your present Concorde Fire coach know that your player cannot attend tryouts (if you are a current Concorde Fire player). Include the details of your situation, player’s name, date of birth, and location (North, Central, South, West, or AIS). Tryout times and locations for each age group will be confirmed on the website on the first day of tryouts. Check the website before you go to the field to be sure there have been no last minute changes. 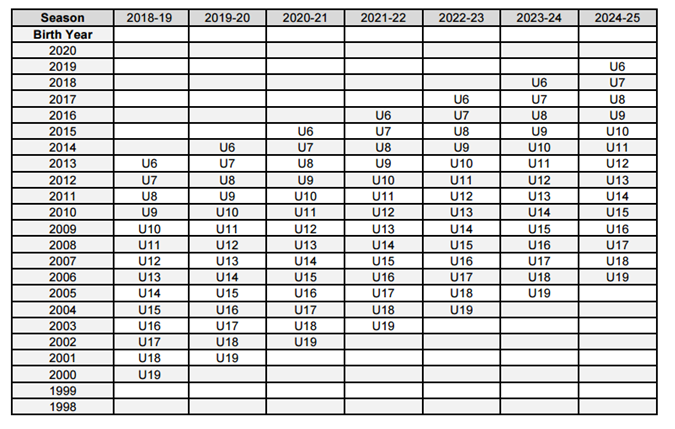 Please use this chart to determine the age group your child should be playing in next season for USYSA. All U12-U19 Players from AIS (Boys and Girls) will tryout at the Concorde Fire Central Location. Please see info above. TEAM CAMP: Included in your players registration is a pre-season team camp. Players are expected to make every effort to attend.